You are currently browsing the The Pet Product Guru blog archives for the day Saturday, December 2nd, 2017. The days of Lassie are over. When Lassie needed to rescue someone, she had to bark and use her paws to get the attention of a human telling them that something was wrong or someone was in trouble. Now with the age of advanced technology, that may no longer be necessary. The scientists at the Open University are working with several dogs charities to train the animals and build “smart kennels” that will have computers installed inside. If an animal needs to raise the alarm that someone is in trouble like the elderly or people with special needs, they will be able to summon emergency personnel at the push of a button. Dr Clara Mancini, head of the animal-computer interaction team at Open University, said the project was aimed at helping the disabled in their homes by making it easier for dogs to perform tasks for their owners such as turning on lights, switching on washing machines and answering the phone. This new technology can also provide pet owners with a new way of communicating with their pets. Dr. Mancini hopes that in the near future they can invent a computer system that allows animals to understand they can engage in conversation with a human on the other side of an internet link. Dr Mancini and her colleagues have been working with Dogs for Disabled to begin designing new computer systems and training dogs to use them. Unlike humans, who have learned to use keyboards and mice to control computers, the scientists are trying to find solutions that are easier for animals to understand. This includes using large bright buttons and touch screen technology. Objects that can be picked up and pulled, or shaken are also being explored. Humans are already starting to use gestures to control computers, with many mobile phones including the iPhone coming with motion sensitive technology that allows them to repeat songs, wipe text or undo actions with a shake of the device. Dr Mancini’s team are also working on computer based toys and games for animals to help them learn how to use the devices. Some of you may be shaking your heads but don’t be surprised if someday you’re in line at an Apple store waiting to pay for a computer for your dog! Special thanks to The Telegraph for providing much of this valuable information. Spend your holidays with the best oldies and standards of all time. 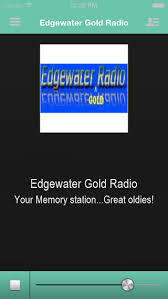 Edgewater Gold Radio plays a perfect mix of oldies and standards plus great holiday favorites! Download the free Edgewater Gold Radio app today and listen from our website, The Edgewater Radio Network!